I was watching this TV show of a Kiwi who went to the Scottish countryside for a culinary adventure in the wild outdoors. In one segment, he hunted some wild birds and as he proceeded to roast the lot on open fire, he took out a pan, placed oil on it, and started frying some apple slices! 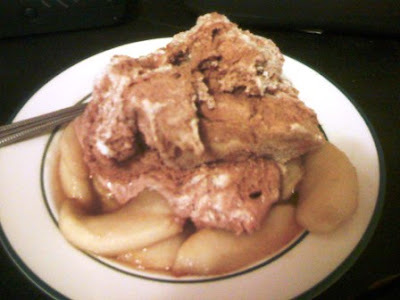 Intrigued, I did a little research and found that apples can indeed be cooked and is also great with ice cream. Well, we had ice cream sitting in the freezer and so it was time for an experiment! 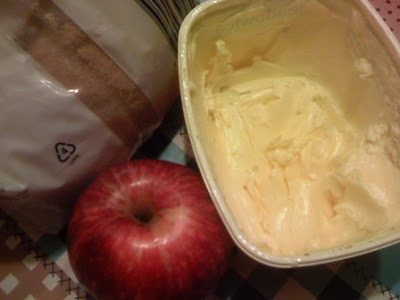 So I peeled and sliced some apples, melted some butter over medium heat, and proceeded to fry the slices for some 10 minutes or so. 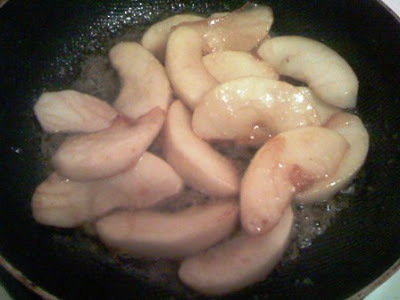 And then I added a bit of brown sugar and waited for it to caramelize, mixing occasionally. I let it cool off for about 5 minutes. It was still warm when I placed ice cream on it. Can't wait! The verdict? The cooking process didn't change the taste of the apple at all! It was the same! Hi Shawie. Oo nga ano, banana split!